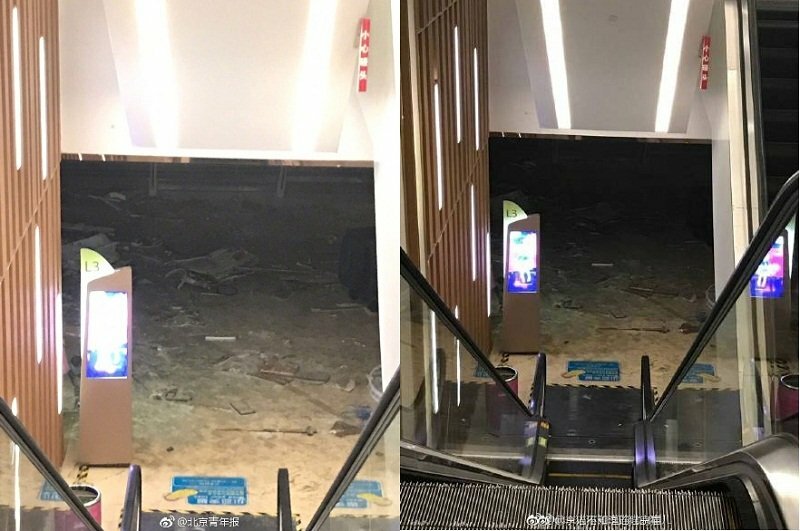 The collapse of a ceiling at the Aegean Shopping Center in northern Beijing forced the evacuation of shoppers from its premises this afternoon, eventually leading to the mall being cordoned off. Although some details are still being determined, the collapse appears to have occurred on the mall’s third floor where its children’s area is located. An unidentified eyewitness told Beijing Youth Report that the incident happened just after 2pm today as she was headed towards the mall’s fifth-floor cafeteria. Photos taken at the scene show a darkened floor covered in debris, but offer no clear explanation of what was going on. The eyewitness said a firetruck arrived at Aegean Shopping Center as the third floor was sealed off, but the incident wasn’t over yet. “Even before we could finish eating, mall workers forced all diners to evacuate the premises due to a ‘fire drill’,” said the eyewitness, further explaining that everyone was forced to leave the mall, which is located in the northeast corner of Line 10 at Taiyanggong Station. By posing as a customer, the reporter for the Beijing Youth Report found out the mall’s explanation for the incident at around 5pm. “Due to a mistake made by renovators on the third floor, the ceiling there came down,” said a mall customer service representative, adding that workers were taking care of the problem. Renovators told the Beijing Youth Report that the roof came down in the area around the Hotwind store, but that it had little impact upon the children’s area. According to renovators, no one was injured in the incident. At present, Aegean Shopping Center’s karaoke lounge and movie theater, located on floors 5 and 6, are still open to the public.